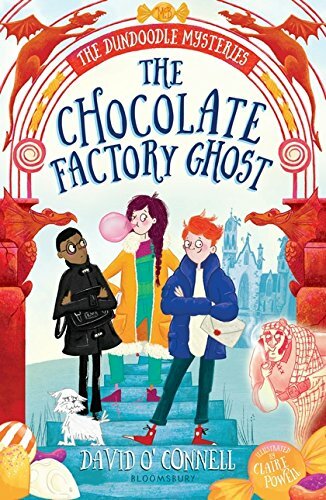 Lucky underpants, magical creatures, bucket-loads of fudge – just some of the tempting treats on offer in The Chocolate Factory Ghost, book one in a very promising new series by David O’Connell. It opens in great style, with young Archie McBudge learning to his astonishment that Great-Uncle Archibald has left him as sole proprietor to his famous fudge factory and the McBudge Confectionary Company. Before you can say ‘always read the small print’, Archie and his mum are settled into their new home Honeystone Hall, Archie has a new dog, and new friends Fliss and Billy too to fill him on local mythology and legends, something that will prove very useful. Because all is not well at the fudge factory, and if Archie can’t discover his uncle’s secret fudge ingredient before stock runs out, its future is very precarious indeed. Uncle Archibald has left six clues for Archie to solve, but his revolting relatives the Puddingham-Pyes are determined he won’t get a chance to work the puzzle out, while a succession of the local malevolent supernatural creatures are out to frustrate him as well. With hints of J K Rowling as well as Roald Dahl this is a thoroughly satisfying and entertaining story, a delicious mix of adventure, comedy and magic. The story unfolds at pace and Claire Powell’s illustrations contribute their own helping of mystery and humour. Delicious!